Although the results are close, the final ranking in the first round could play an important symbolic role ahead of the May 7 run-off. Most early polls are giving Macron 23-24%, ahead of Le Pen with about 22%. But one poll from Kantar Sofres says Le Pen and Macron both scored 23% in the first round. 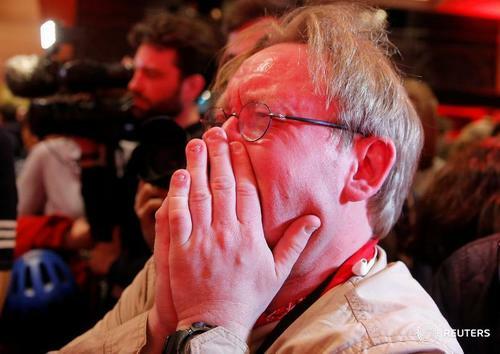 Matthias Blamont describes the scene at the Le Pen supporters' rally in the northern National Front (FN) stronghold of Henin-Beaumont: An explosion of joy welcomed the results ... with dozens of flag-waving supporters shouting "Marine Presidente" or singing the Marseillaise. One woman crossed herself repeatedly, shouting" I don't believe it. At last!" A 26-year-old hairdresser, Aurore Cappelle, told Reuters: "We're not totally sure of the figures yet, but it's an enormous result. ... I have supported FN ever since I started voting." 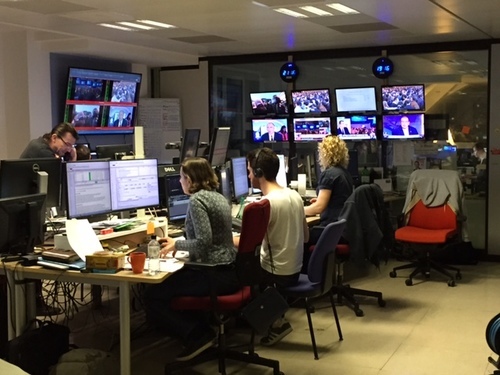 Marine Le Pen's campaign director David Rachline meanwhile tells BFM tv the French election is now a "referendum for or against globalisation". French Conservative candidate Fillon concedes defeat in election. Conservative Francois Fillon, whose campaign became mired in allegations that he paid his wife hundreds of thousands of euros of public money, says "the obstacles placed in front of me were too numerous and too cruel". Fillon has rejected the charges. Urging voters to support centrist Emmanuel Macron, he says in a live tv address that the FN has a "history of violence and intolerance (and) its programme would lead the country on the road to bankruptcy." Euro is higher in thin out-of-hours dealing immediately following the first round, with banks quoting around $1.092 versus $1.072 on Friday evening, according to Reuters data. 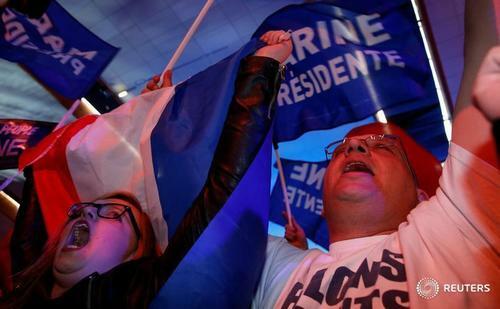 France votes for a new president. Take a look at the latest polls for the first and second rounds. President Francois Hollande has called his former protege Emmanuel Macron to congratulate him on winning the first round. 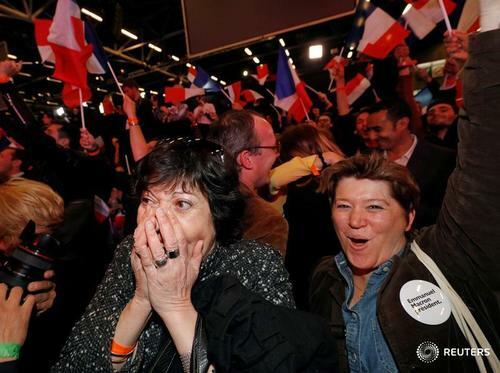 Calling the result an "act of French pride," far-right leader Marine Le Pen tells cheering supporters: "The big issue of this election is the savage globalisation which threatens our society." Marine Le Pen, who came in second in the first round of France's election according to projections, said change will not come with Hollande's "heir." Current French President Francois Holland called Emmanuel Macron to congratulate him after he was projected to have come in first. 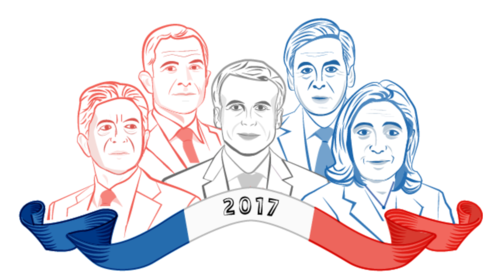 Clarification: This post was edited to show Macron and Le Pen were projected to come in first and second. 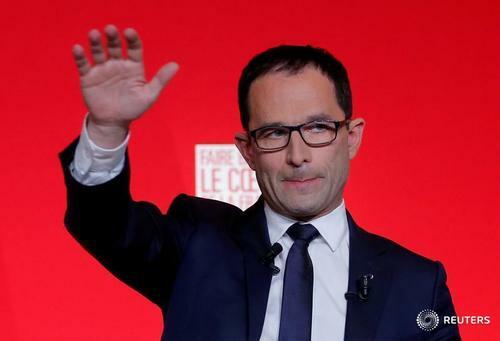 ReutersGerman politicians on Sunday welcomed the projected victory of centrist Emmanuel Macron in the first round of the French presidential election, but said they remained concerned about the combined strength of the anti-European vote. 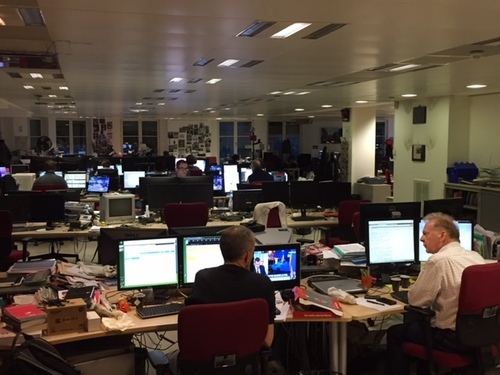 Election night in a newsroom can only mean one thing - takeaway pizza. The euro jumped to its highest since mid-November in early trading on Sunday, after early projections indicated that centrist Emmanuel Macron and far-right Marine Le Pen had made it to the second round of the French presidential election. Markets had been worried that the far-left, eurosceptic Jean-Luc Melenchon, who had surged in the polls in recent weeks, could jump ahead of Macron to make it into the final runoff against Le Pen, giving voters a choice between two radical candidates who would threaten the future of the EU. As investors breathed a collective sigh of relief, the euro soared 2 percent to $1.09395, its highest level since Nov. 10, the day after the results of the U.S. presidential election, as some markets opened in Asia. "The base-case scenario was confirmed. The market reaction should be limited, there is no big surprise," Christopher Dembik, head of macroeconomic research at Saxo bank tells our Paris banking reporter Maya Nikolaeva. Some clarification from Interior ministry on those figures appearing to show Le Pen in first place in the early ballot returns, contrary to polls putting Macron in first place with Le Pen second. The partial figures based on the counting of 20 million votes do not include votes from France's largest cities, the ministry says. 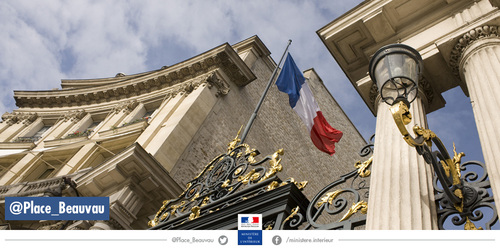 There have been some protests in Paris this evening, but it is mostly calm, according to Reuters reporters. In the Bastille area, a traditional focal point for demonstrations, about 300 protestors ran down a street chased by CRS riot police. There were a few arrests and some tear gas was thrown, but police outnumbered protestors, our reporter Julien Pretot says. 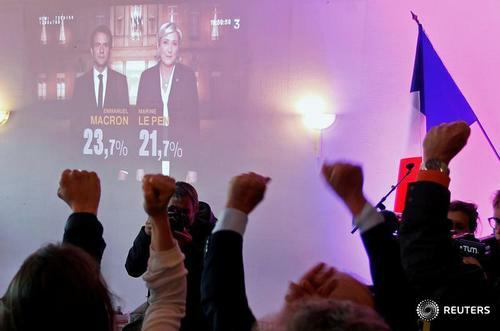 Projections for the decisive second round have started to come in based on Sunday's preliminary results, predicting a victory for centrist candidate Emmanuel Macron. Ipsos/Sopra Steria puts him on 62% in the runoff, against 38% for far-right candidate Marine Le Pen. Harris sees Macron reaching the Elysee with 64%. @tim.hepher where can I get these numbers from the Interior Ministry? Paul Lambert, London-based fund manager and head of currency management at Insight Investment management. "All the polling that we are seeing would suggest that in the second round it would be very difficult for Le Pen to make major further gains, while Macron should pick up significant further votes. I think people will be fairly confident that Macron will win in the second round and the market will be relieved by that. The euro will benefit from the perceived decline in the break-up risk in the euro area. It was expected that Macron would get through so I’m not sure there will be significant further (euro) moves tomorrow. The euro might see a little bit more strength over the coming days and a tightening of French bond spreads against Bunds, generally 'risk-on' currencies will probably do quite well, peripheral bond yields come down and probably upside in European stocks." 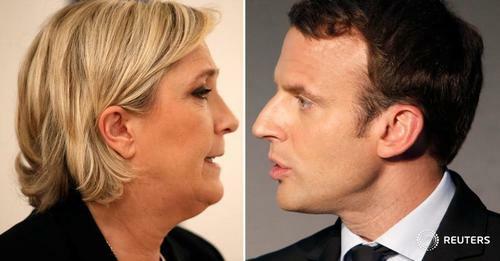 ReutersCentrist Emmanuel Macron and far-right leader Marine Le Pen are set to face each other in a May 7 runoff for the French presidency after coming first and second in Sunday's first round of voting, according to multiple projections.